Margaret May CFP®, CLU, ChFC, CAP® is a charismatic speaker, author, and dynamic seminar leader. Her warm and engaging style gives audiences a refreshing yet practical vision of how to live and leave a legacy unique to their passion and purpose to make a difference in the world. 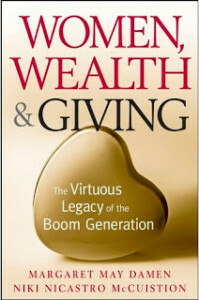 She is co-author of Women, Wealth & Giving: The Virtuous Legacy of the Boom Generation, (John Wiley & Sons, 2010) and a frequent and popular national keynote speaker and consultant. Her forthcoming book Your Legacy: Live It, Love It, Leave It! Is scheduled for 2017 publication. 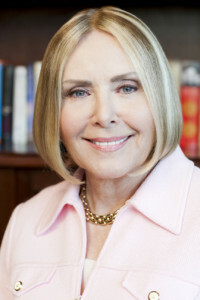 Her 35 year career in education, finance, and philanthropy started as an Associate Vice President for Development at Boston University and continued as public relations director for New England Conservatory of Music and Executive Director of Arts/Boston, and included 18-years as a Senior Financial Advisor with American Express Financial Advisors. Damen founded the Institute for Women and Wealth in 2000. She served on the national executive board of the Partnership for Philanthropic Planning, PPP, and has presented at national and international AFP, AHP and NCPG (PPP) conferences. Margaret May holds a Bachelor and Masters Degree from Boston University and is a former member of the National Alumni Council Board and listed in “Who’s Who in Finance in America.” She is a flutist and a member of Sigma Alpha Iota International Music Fraternity. She is currently the Endowment Officer for the Kravis Center for the Performing Arts, West Palm Beach, FL, and a facilitator of the prestigious Chartered Advisor in Philanthropy study forum (CAP®) sponsored by The American College, Bryn Mawr, PA. Established by Margaret May in 2000, The Institute for Women and Wealth transcends traditional estate planning methods and empowers women to resolve many of the psychological barriers that inhibit the success of family legacy and philanthropic giving issues. Workshops provide a forum for financially successful women to achieve a better understanding of the financial, emotional, spiritual, and psychological influences that guide their lives. Through workshops, retreats and private briefings, clients can come to understand and create both private and public legacies attuned to their unique hopes, dreams and aspirations. To transform our community into a more sustainable, vibrant, and compassionate environment.